There is too much money being printed. No rocket science is needed to reach that conclusion. The markets are giving us a clear message. For example, gold is trading at a record high, while silver has reached a 30-year high. Those new high prices are happening for a reason. The precious metals are sensitive to changes in inflation, both actual as well as future expectations. Rising precious metal prices tell us that there is a lot of inflation in the pipeline, but they are not alone in giving us this message. More generally, look at the trend in commodity prices over the past few months in the following chart of the CRB Continuing Commodity Index, which is based on the price of 19 different commodities. On June 4th the CRB Index closed at 450.24. 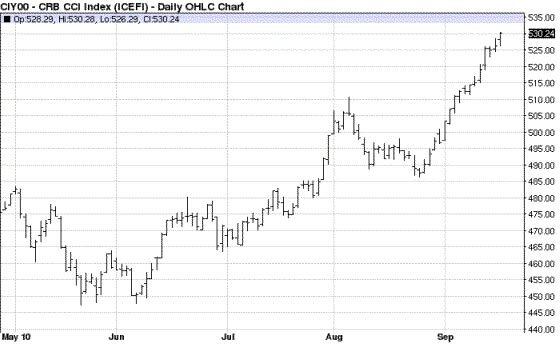 Here we are just 3-1/2 months later, and the CRB Index closed Friday at 530.24, up 17.7%. That is a HUGE jump in prices in such a short period of time. To put this price rise into perspective, it is a 61.8% annual rate of “appreciation” – though we should call it by what it really is, namely, “price inflation”. Because too much money has been printed for years, not just over the past three months, which can be illustrated by comparing M3 to the total US population. In 2000 there were $26,977 in circulation, as measured by M3, for every man, woman and child in the United States. That amount has ballooned to $46,538, a 7.1% annual rate of growth, which is more than 7-times the 0.9% annual rate of population growth during this period. Demand for money is usually ignored, but it is an important part of the equation. Unfortunately, demand cannot be measured, so we again need to rely on observations of market prices to determine the prevailing trend in the demand for dollars at any moment. So, for example, let’s look at the US Dollar Index, which measures the dollar’s rate of exchange against a basket of currencies. While commodities have been rising since June 4th, the Dollar Index has been falling. It is down 7.9% over this period, a 27.6% annualized rate of decline. Given that people are opting to hold other currencies in preference to the dollar, as evidenced by the dollar’s falling exchange rate, it is clear that the demand for the dollar is falling. Thus, the dollar is being hit by both rising supply and falling demand. We know from Economics 101 that this condition results in falling prices, which when applied to money means declining purchasing power, or what today is usually called “inflation”. If monetary policy is not corrected and inflation is not reversed, in time hyperinflation will be the inevitable result. I have been warning about hyperinflation since March 2, 2009 when I wrote that the dollar was on the cusp of hyperinflation. I noted that “the federal government has embarked on a course of runaway spending, and it is runaway government spending that causes runaway inflation”, which if left uncontrolled leads to hyperinflation. The trend has not changed for the better. From February 28, 2009 to August 31, 2010, runaway federal government spending has resulted in a $2.57 trillion increase in the national debt. But over this period GDP increased by about $0.5 trillion, and the increase in economic activity is even less after adjusting for inflation. So clearly we need to ask ourselves, what have the bailouts and stimulus programs really accomplished? The answer is very little in terms of economic activity, but there is an ominous consequence from this foolish binge by policymakers of soaring debt and reckless money creation. Given that these dollars are not being used to generate economic activity, they are now sloshing around the globe looking for a safe home. Tangible assets are one of the safest places to be to protect your wealth from a currency whose purchasing power is eroding. The result is that the commodity markets are on fire. Prices are not rising because of a shortage of commodities, but rather, there is a surfeit of dollars. Too much currency has been created, relative to current economic activity. Without an abrupt about-face to end the wrongheaded policies being followed by policymakers, there can be only one conclusion. The dollar is headed toward hyperinflation. The new record highs in gold and silver, an across-the-board rise in commodity prices and the renewed downtrend in the dollar's rate of exchange are the “writing on the wall”..
James Turk is the Founder & Chairman of GoldMoney.com <http://goldmoney.com/>. He is the co-author of The Collapse of the Dollar <www.dollarcollapse.com> and publisher of the Free Gold Money Report<>http://www.fgmr.com<>. Copyright © 2010 by James Turk. All rights reserved.